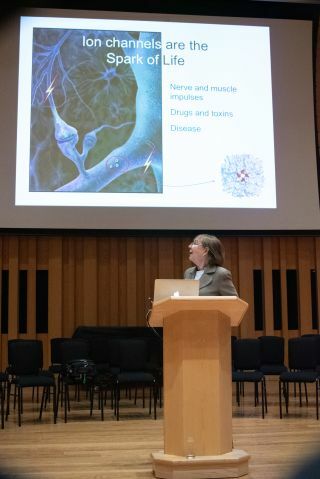 Professor Dame Frances Ashcroft gives talk entitled "The spark of life - the story of ion channels" at Millfield School's Biology and Psychology Symposium to over 250 students from 11 local schools. On Thursday 10th January 2019, Frances Ashcroft attended Millfield School's 25th annual Biology and Psychology Symposium, where visiting sixth form students were treated to lectures and workshops from leading academics in Biology and Psychology. Professor Ashcroft's talk explained how electrical impulses are generated by ion channels and discussed the ways that ion channels regulate our lives, the dramatic consequences when things go wrong and how nature has created a battery of toxins that target ion channels. She also demonstrated how an understanding of the ion channels involved can lead to a new therapy for patients born with a rare form of diabetes. With thanks to Millfield School for the Photograph. Credit: David Titchener. She delivered her talk to more than 250 pupils from a mix of state and independent schools in Somerset, many of whom joined her at the reception afterwards. More information about the event can be found on the Millfield website. A Millfield produced video outlining the event and featuring Dame Ashcroft can be viewed here.